Why climb Lembert Dome? Fancy a smashing new hat you saw in one of the Yosemite gift shops? Climb Lembert Dome in the afternoon and there's a good chance your dowdy old lid will get blown to somewhere near Mono Lake, giving you no choice but to buy a new one. 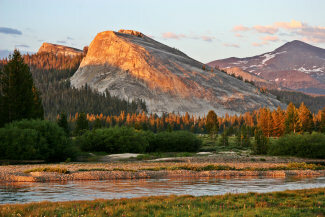 If that's not attraction enough, Lembert Dome also offers excellent views looking west across Tuolumne Meadows. Difficulty: It's a short hike, but you are climbing a mountain, and you need to be careful to pick a safe route. A 4 out of 10. Best Time to Visit: Pleasant anytime Tioga Road is open (June through October, usually), but best of all early, when the meadows are green. Crowd Factor: Not bad; the dome is large and a bit awkward to reach, so the visitors aren't too many or too close together. Parking: There's a parking lot at the trailhead, which is also the trailhead for the Dog Lake trail. Nearest Restrooms: At the trailhead (outhouse variety); restrooms with running water available at the Tuolumne Meadows Visitor Information Center a mile or so to the west. Getting There: From Yosemite Valley, take highway 120 ten miles (16.8 km) to the Crane Flat turnoff onto Tioga Road, then take Tioga Road 40 miles (64 km) east to reach the trailhead at the far eastern edge of Tuolumne Meadows. From Yosemite's east entrance at Tioga Pass, take the Tioga Road west 7 miles (11 km) to the trailhead. Here's a Google Street View Panorama of the turnoff to the parking area.